Discussion in '3rd Gen. Tacomas (2016+)' started by Johnny77, Apr 11, 2019. Anyone have any experience with these grills? Maybe have some pictures to share? Love that they have the raptor lights already installed and most of all have the bracket for the TSS sensor. itzWicks, btcca4, arguelles1980 and 3 others like this. daddy_o and CygnusX191 like this. Where do you buy it from? I'll guinea pig it. Pistol Pete, docsails, David K and 1 other person like this. Thanks bro. I was doing some research on aftermarket grills other than the TRD Pro grill and found these. They seem to be a sweet deal and the price is pretty competitive. I'm a big fan of the BAMF grill but wish they would make one that accommodates the TSS sensor. Yea looks very similar I wonder if it's the same seller. The version I found has the TSS sensor bracket also. I like the hidden aspect of the sensor vs. the square plate seen on others with the TSS bracket. I would think about a piece of plexiglass to protect the sensor though. I will look into this more when I am off work today. oconnor and Tacovinyl like this. Yea I like that the sensor is hidden away. I wouldn't mind jumping on this and being the guinea pig but wondering if anyone has already purchased and can speak to the quality of work. Their IG seems to have plenty of Tacomas with the grill on so I figured someone on TW might be able to contribute. I am thinking about doing it. The price is within reason and I really like the TSS placement. Plus it's something different than the all the Pro grilles. Nothing wrong with those running the pro grilles, they are nice but there are just too many of them now. I am putting one in my cart to think about it some more. Looks like @Quicksand19NCVA has one. Lets see if he will chime in. Now that is a good looking grill! I just watched the install video and I read more on the description on the Etsy page. From both of those I can conclude that it does include a piece of plexiglass protectant which I mentioned earlier would be a good idea. I am convinced this is going to be a good grille and it looks like they thought of everything. I need to decide if I want one that says Tacoma or Taco. Hey guys, I've had no issues with the sensor at all with this grill installed, that includes being lifted 2.5" and on 33s. Looks great too! itzWicks, TacomaTurtle, DartFrog and 8 others like this. How long have you had it and does it in fact include the plexiglass protector? What can you say about the quality of the material of the grille itself, the lights, and the letters? Also, it looks like you got the color matched letters, how about the paint quality and actual match? Sorry about bombarding you with questions, but I am very interested in this product as it looks really good and I am impressed with the hidden sensor. Which leads to another thought/question. Why do all the other grille makers do the little square for the sensor and this one does not? I guess you have not had any interference with the design and no false alarms. I've driven with it installed for around 600 miles and yes there is plexiglass which helps protect the sensor. The quality and color match is really good, gotten a lot of compliments on this grille, I got it because almost everyone puts the pro grille in and I wanted to stick out a little bit. It was def worth the money! Jaybird947 and daddy_o like this. Jaybird947, Señor, Quicksand19NCVA and 1 other person like this. Thanks for joining in. I just found this out since I have had time to do more research. 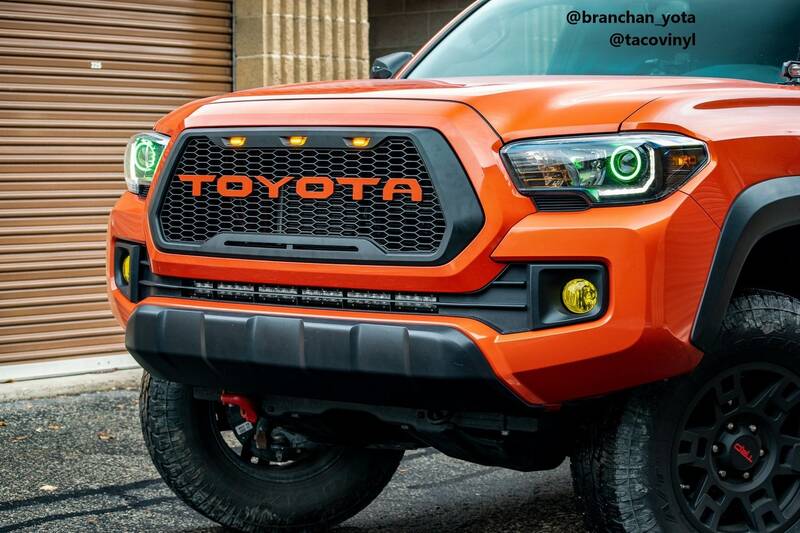 Do you have any pics of a grille that says TACO?